Highway Y, Ava, MO 417-683-5750 Ava Country Club is a 9-hole regulation length golf course in Ava, Missouri. This medium-length layout will reward good shots and provide a fun golf outing for everyone. 1002 W 1st Street, Mountain Grove, MO 417-926-5700 Randel-Hinkle Municipal Golf Course is an 18-hole regulation length golf course in Mountain Grove, Missouri. This short layout will reward good shots and provide a fun golf outing for everyone. Highway MM, Mountain Grove, MO 417-926-5374 Wedgewood Country Club is a 9-hole regulation length golf course in Mountain Grove, Missouri. This medium-length layout will reward good shots and provide a fun golf outing for everyone. HC 5 Box 5700, Theodosia, MO 417-273-4877 Theodosia Country Club is a 9-hole regulation length golf course in Theodosia, Missouri. This layout provides for a fun golf experience for golfers of all skill levels. 1402 Country Club Drive,, West Plains MO 417-256-7197 West Plains Country Club is an 18-hole regulation length golf course in West Plains, Missouri. This short layout has 3 sets of teeboxes for a fun, but challenging golfing experience. Howell County BB Highway, West Plains MO 417-256-9824 West Plains Municipal Golf Course is an 18-hole regulation length golf course in West Plains, Missouri. This short layout has 3 sets of teeboxes for a fun, but challenging golfing experience. Bull Shoals Lake is a sportsman’s paradise with clean, clear waters, and almost 1,000 miles of pristine shoreline. With close proximity to Branson, visitors find Bull Shoals less crowded than it’s neighboring lakes, and enjoy awesome fishing, boating, swimming, scuba diving, skiing and relaxing. You’ll enjoy Largemouth, Smallmouth, Kentucky, Crappie, Catfish, Bluegill, White Bass and Walleye! move deeper in the summer months and can be caught on jigs in deeper brush piles. Walleye:Your best times for Walleye are winter through early summer using jigging spoons, jerkbaits, or live nightcrawlers. Lake Taneycomo has some of the finest trout fishing you can ever find! The cold, clear waters are the perfect haven for trophy Rainbow Trout and Brown Trout. State record trout have been caught regularly here, and a new record is just waiting to happen! The lake has almost 2,080 surface acres and is located in Branson, Missouri. Rainbow Trout: Fishing is good year round. The best baits are power bait, small jigs, and flys. Brown Trout: Fishing is usually better in the fall to winter using jerkbaits or live night crawlers. Located in close proximity to Branson, Table Rock Lake on the White River has over 52,000 acres and almost 800 miles of shoreline. Recreation includes swimming, boating, skiing, scuba diving, jet skis and awesome fishing. Table Rock Lake is a fisherman’s paradise and is well known as a top bass fishing lake. You’ll find Largemouth, Smallmouth, Kentucky, Crappie, Catfish, Bluegill and White Bass. Bass: The best times for bass are from early spring to late fall, and can be caught on a variety of shallow water lures. Bass tend to suspend over open water through the summer and winter months. Crappie: Crappie are best from late March through early June. They are typically found in shallow spawning pockets, and concentrated around submerged timber. They’re caught by using small minnow imitating baits. White Bass: The best time to catch White Bass is the summer months. We’ll be looking for schools on main lake points first thing in the morning. The best baits are jigging spoons and small topwater lures. The Mark Twain National Forest is located in southern and central Missouri. The Forest is comprised of 1.5 million acres with many streams fed by some of the largest springs in the country. Seven Congressionally designated wildernesses cover 63,000 acres. 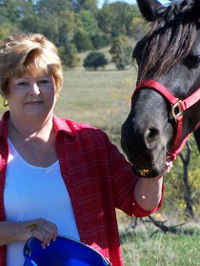 Douglas County Fox Trotters have a trail ride every Wednesday, starting at Murphy’s Station at 9am. Visit their site for more information.